After a couple of tough summers due to flood related damage, Fort Whoop Up is optimistic about another season of spreading the word about southern Alberta history. While the Fort is already open, the official opening is June 1. “The biggest thing is we’re not as focused on doing flood related work. We’re able to work on training our staff and focussing on being a historical site instead of a flood zone, said Fort Whoop Up executive director Doran Degenstein. Last June, rising flood waters forced an army of volunteers to relocate and safely store 40,000 items and staff to completely refurbish the fort. 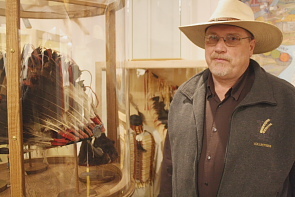 Fortunately the floods only destroyed two of the exhibits — a covered wagon exhibit which has been replaced with a new First Nations exhibit featuring ceremonial headdresses. Degenstein said there isn’t much they can do to prevent floods and flood damage other than to ensure they have quick access to moving boxes and supplies. “ We have a flood plan for the society, but we have limited resources. But we have a lot to learn from the events of the past two years. We looked at improving how we protect our collection,” he continued. “ We have had a great amount of support form the 200 people who helped us to move 45,000 items that all needed to be boxed,” he said. “ Now we have a cargo trailer dedicated to holding emergency supplies,” he continued. Fort Whoop-Up covers several aspects of very exciting time in Southern Alberta and early Canadian history— 1870-72, which included a lot of American traders coming north to seek their fortunes in the lucrative buffalo robe trades with the Blackfoot people. “ Principally we’re about the robe trade. And yes that included alcohol. Independent traders moved north into the British Possessions after the Blackfoot moved north after the Baker Massacre (Jan. 23, 1870),” he related. 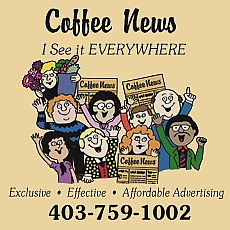 Historic Lethbridge and several Lethbridge organizations are going back to the ’70s for the annual Historic Lethbridge Festival with several events happening in the next couple of weeks celebrating the styles, music and movies of the 1970s. Things begin on Friday, May 2 at the Southern Alberta Art Gallery with a 1970s happy hour from 5-7 p.m. There will be live entertainment, ”70s themed cocktails, frosty craft beers and a costume contest for best dressed 1970’s outfits, so dig out that old polyester suit and wide tie or your favourite disco outfit on and come out and dance. “We decided we wanted to cover what was important,” said Brian Black, chairman of the Historic Lethbridge community who is also teaches at the University of Lethbridge in the music department. “It was an important year for building in Lethbridge. The Whoop Up Drive bridge was built in the ’70s. It is difficult to imagine Lethbridge without it and the University of Lethbridge was being built as well,” he continued. He observed the tumultuous 1970s were an important time in North American history, with the Vietnam War, the Kent State shootings, Richard Nixon, freeing hostages in Iran and in Canada beginning with the FLQ October crisis, though the era of Pierre Elliot Trudeau and ending with the NEP and the Quebec referendum. So there is a lot of ground to cover for this year’s festival. “We wanted to capture the vibrant and exciting culture happening,” said Black who remembered being a young adult in Montreal during the FLQ crisis. “ It’s the first time we’ve been involved,“ said Marie Hélené Lyle, of CineImagine, one of several French cultural organizations operating at the La Cite des Prairies, and who all will be contributing. The film is about the FLQ crisis, which sparked Pierre Elliott Trudeau to implement the War Measures Act. 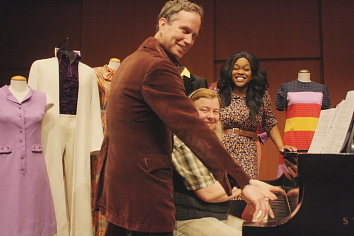 The film will be screened at 7 p.m., May 7. “ I remember there was troops all over the place. it seemed so arbitrary. But it made everybody just take a step back,” recalled Black of the October Crisis. 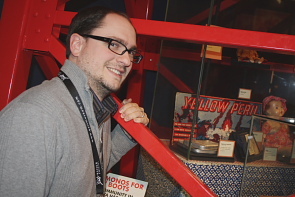 For something slightly different, the Galt Museum features the second annual Nerdfest Redux. Chris Roedler will be hosting the event. “We had people last year asking us whether we were going to do this event again,” explained trivia night host Chris Roedler, who is co-organizing it with Leslie Hall. “We want to get a lot of the first timers, who were here last year to come back. So if that’s what it takes, that’s what we’ll do,” he continued adding some of the highlights from last year were watching people enjoy it including one person bringing a 12 pack of Mountain Dew. “ So we knew he was going to be there for the night,” he said. And Roedler’s dad who came to the trivia night on his own, and joined a team which eventually won the whole thing. There will be lots of prizes for the trivia night/ game night, March 7. Day two, March 7, begins from 7-9 p.m. with trivia night with special hosts including “pop culture aficionado” Leila Armstrong, Kapow Comics’ Wallie Desruisseaux, artist and Norse enthusiast Darcy Logan, University of Lethbridge new media specialist Gord Taylor and comic expert Eric Dyck to name a few. It’s a happy coincidence that within a few weeks of each other, there was a big fundraiser to help save the remaining buildings in Lethbridge’s Chinatown and The Galt Museum opened an exhibit exploring the art of China. “It’s a combination of a traveling exhibit from the Royal Ontario Museum and a few objects from our own Galt Museum collection,” said curator Wendy Aitkens. The exhibit includes intricately carved furniture from the Galt Museum Collection and bronze, jade and ceramics , some of them dating back to 11,000 B.C..
“ But we talk about the symbolism and what skills were used to create the pieces,” Aitkens continued. “Some of them (the symbols) offered protection or a healthy life or many babies,” she said adding she was interested in where these pieces originate and especially some of the pottery an the skills used to create it. “I‘ve made pottery for 25 years,” she said adding the exhibit’s examination of pottery techniques intrigued her. There are selections of earthenware, created in a low fire as well as porcelain developed in high fire. “They kept that secret until the 1700s,” she described. “Bronze is very hard and strong. But they had a technique for bronze casting where they could create very intricate and complex pieces,” she said. “Some of these pieces are very old, from 11,000-13,000 B.C, but they are very durable so they can be part of the Royal Ontario Museum’s traveling exhibit. So that shows their durability,” she said. The Galt Museum pieces chosen include gifts made brought over to mayor Carpenter in the 1990s from Lethbridge’s sister city in China including a tapestry. Plus there is furniture donated by local Chinese families. And as a nod to Lethbridge’s Chinatown, there are three bowls rescued from the Chinese National Building before it was closed and torn down after being damaged by wind last summer. There are also school books used in the ’50s and ’60s to teach Chinese children about their culture and language during special Saturday classes. “They are very fragile, but they are wonderful,” Aitkens gushed. 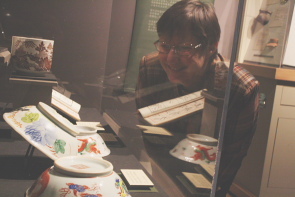 The Galt Museum explores China with a new exhibit opening today, Jan. 31. “It’s a combination of a traveling exhibit from the Royal Ontario Museum and a few objects from our own Galt Museum collection,” said curator Wendy Aitkens of the exhibit Arts of China. The exhibit features intricately carved furniture from the Galt Museum collection and bronze, jade and ceramics which date back to 11,000 B.C.. 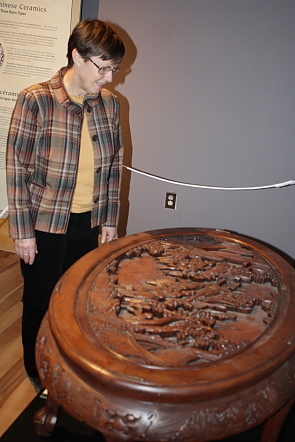 The Galt Museum opened the new exhibit just in time to celebrate the Chinese new year, the Year of the horse, Jan. 31. While Arts of China is open to the public today, the official opening is Feb. 9 from 2-3 p.m. when the Galt Museum welcomes special guest Lisa Claypool, University of Alberta associate professor of history, art, design and visual culture. She will discuss the meaning of jades, bronzes and porcelain in the culture of the Quing Dynasty (1644-1911), the last dynasty in China.